SCVHistory.com LW2952 | SCV Exonumia | 1842/1948 Placerita Gold Discovery Medal (Bronze), 1948. This isn't actually a "local" issue, but it commemorates a local event: the discovery of gold in Placerita Canyon. Minted in 1948, the medal was probably part of a multi-issue series marking the centennial of James Marshall's discovery at Sutter's Mill. The medals were manufactured by Los Angeles Stamp & Stationery Co. (known prior to 1935 as Los Angeles Rubber Stamp Co., maker of most California merchant tokens). It is known in three varieties (two original, one subsequent restrike): copper or bronze; and gilt (gold-washed) copper or bronze, both from 1948; and a uniface aluminum Anillo restrike from 1968 (see below). All three are illustrated here. We don't know if the un-gilt variety is an off-metal error. Californians celebrated the centennial in grand style, and Newhall residents didn't shrink from spreading their "Look at us, we were first" message. After all, Francisco Lopez's discovery of gold in Placerita Canyon predates Marshall's more famous discovery by six years — and the fact is acknowledged on the obverse (face) of this medal, which reads: "First Gold Discovery, Placerita Canyon," with the dual dates of 1842 and 1948 in the field amid a miner's pick, shovel, pan and scale. 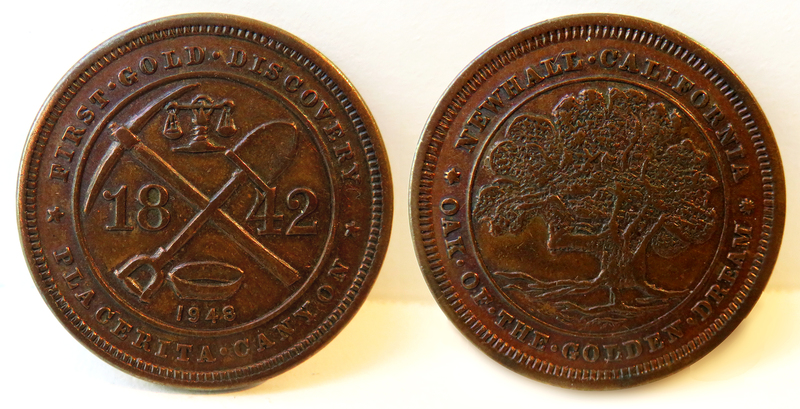 The reverse reads, "Newhall, California / Oak of the Golden Dream," with an image of the tree where Lopez reputedly napped and dreamed of riches — then dug up some wild onions and found gold flakes clinging to the roots. Visit the Placerita Canyon Nature Center and you'll find the tree about a quarter-mile from the park entrance. Lopez detailed the facts of the discovery in a mining claim, which was granted, making his 1842 discovery the the first "documented" discovery in California. Undocumented discoveries were reported between Hasley Canyon and Piru even earlier. Postscript: In 1968, Anillo Industries of Orange, Calif., purchased the inventory of Los Angeles Stamp & Stationery Co. and struck uniface (one-sided) aluminum examples from that company's 3,492 original dies, including this Placerita gold discovery medal. It is believed that only four sets of the restrikes were made, although one source puts the number of Anillo restrikes at 25 each. LW2952: 9600 dpi jpeg from digial images of original medal purchased 2017 by Leon Worden. Fremont for President 1856 "Jessie's Choice"